Visiting Casa del Pueblo was a dream come true for me. Six months prior to visiting Uruguay, I began to take a serious look at lifestyles throughout the World and wanted to find a country that offered rich culture, good healthcare and a reasonable cost of living without the crime of a major North American City. That is when I happened to come across a picture of a beautiful white castle overlooking the Ocean. It turns out that this fascinating castle could be found in a little south american country called Uruguay. 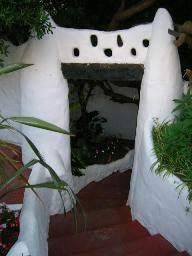 When I began to research it, I learned that Casa del Pueblo was also one of the popular Hotels in Uruguay. I was so intrigued by the photo that I continued to research and read more about Uruguay and dsicovered that this picture represented one of Uruguays most unique tourist attractions. I downloaded the picture and set it as my desktop wall paper, professing to friends that I would be seeing it soon. It was almost sunset and I began to take pictures. Soon I realized, the camera batteries were dead and I would have to come back again. Seeing the magnificent beauty of this Uruguay attraction, It didnt take too much convincing that i would be back. The second time I visited this uniquely interesting, Uruguay attraction was on a local bus tour, that was catered for the English Language. 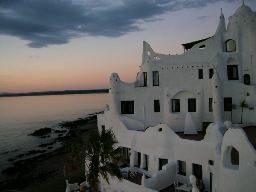 Our Group enjoyed the amazing sunset from the spacious decks of Casa Pueblo. All of the pictures in Uruguay that you see on this page were taken with my simple digital camera. If you are planning to Explore Uruguay, then you definately want to visit this World renowned Castle in the one of the most beautiful areas of South America!